‘Rethinking Cultural Resource Management in Southeast Asia’ explores the challenges facing efforts to protect the cultural assets of Southeast Asia from the ravages of tourism and economic development. 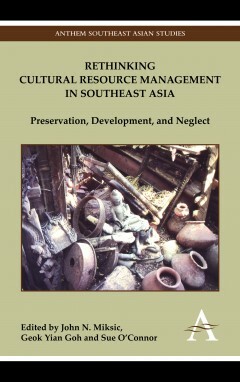 ‘Rethinking Cultural Resource Management in Southeast Asia’ explores the challenges facing efforts to protect Southeast Asia’s indigenous cultures and archaeological sites from the ravages of tourism and economic development. The tourism industry has long recognized the economic benefits of cultural resources, and in Southeast Asia many countries have already developed elements of their cultural heritage into tourist attractions. If not properly managed, the side effects of this development have the potential to be disastrous. As such, there is a now pressing need to create a coordinated study of the growing field of cultural resource management (CRM). This volume develops a set of themes, including: tourism and its alternatives as CRM strategies; the mitigation of the effects of tourism and other developmental forces; site preservation, ranging from monuments to vernacular architecture, villages, and urban neighbourhoods; and legal issues facing resource management. Its essays discuss innovative approaches to CRM, and avoid the assumption that Euro-American solutions are applicable worldwide; in the Southeast Asian context, funding is often limited, whilst concepts of cultural resource ownership and governmental authority differ from those in the West. The ultimate goal of CRM is sustainable management, but the convergence between development and preservation is often tense because it entails compromise and negotiation between parties with conflicting interests. The frequently cited concept of “sustainability” is therefore subject to differing interpretations, and conflicts between the short term and long term, local and global, and restoration and regeneration are perennial sources of dispute between stakeholders. Southeast Asian cultures are thus under intense pressure on many fronts. What this volume seeks to illuminate is the need for effective management strategies to reduce the destructive potential of these conflicting interests: tourism in this region is highly dependent on cultural attractions, and proper management strategies would ensure that these cultural assets are preserved. In turn, this will allow these cultural resources to contribute significantly to the material wellbeing – and stability – of their respective societies. John N. Miksic is Associate Professor in the Department of Southeast Asian Studies, National University of Singapore, and Head of the Archaeological Unit of the Nalanda-Sriwĳaya Centre, Institute for Southeast Asian Studies. Geok Yian Goh is Assistant Professor in the Minor in History Programme at the School of Humanities and Social Sciences, Nanyang Technological University. Sue O’Connor is Professor of Archaeology in the School of Culture, History and Languages at the College of Asia and the Pacific, Australian National University.